Our in-season hours are now in effect. Remember, you can also stop in to visit our display yard anytime. Be the first to put a flagpole under the tree! We are featuring a 20' flagpole set, installed, including a 3' x 5' US flag, regular price $795, now only $745 until December 22, 2018. For details see our flagpole specials page or call us at 610-437-1944 for more information. This can be a wonderful gift that will be enjoyed for many years to come! Our flag took a beating in the nor'easter on March 2nd adn we needed to take it down (the rest of the way), repair the mechanism and replace it with a new flag (which we do each spring anyway). Check out our facebook page facebook.com/AmericanFence/ to see photos of the damage! Our huge flag is again flying proudly . . . and now it has new lighting at night. We had electrical work done earlier this year which provides new lighting to our display yard as well as special LED lights for the flag. Check our facebook page, www.facebook.com/AmericanFence , to see photos. On Thursday November 17 the team at American Fence & Flag packed 19 shoe boxes for Samaritan's Purse ministeries Operation Christmas Child. Prior to the event several people shopped for the items to fill the boxes, including toothbrushes and toothpaste, wash cloths and soap, hairbrushes and combs, socks, balls, marbles, coloring books, crayons and a Beanie Baby stuffed animal. We had a blast putting them together and thinking about the child who would be excited to open it! The boxes will be tracked and we will get to learn where the child lives who received each box. Everyone is looking forward to knowing where they go. Look at our FaceBook page for more photos! Head out to Kospia Farms in Alburtis for a Veteran's Day event on November 5 from 10-5. Check their Facebook page for more information . . .
Did you catch the article about us in "Pride of Place" in the June edition of Lehigh Valley Marketplace magazine? See us on a bus-board? Discover our ads in Lehigh Valley magazine or Lehigh Valley Marketplace? Trip over us as we popped up while you were browsing the web? Drive by our display yard and the big flag? Admire a fence that had one of our signs? See one of our vehicles? Hear about us from Bobby Gunther-Walsh? We'd love to know how you found us - please comment on our Facebook page to let us know. On Friday September 11, 2015 the crews and staff of American Fence & Flag remembered the tragic events of 14 years ago along with the heroic repsonse of the American people as they raised a beautiful new US flag to replace the old one. Check our our Facebook page to see a photo, or better yet, stop by and see it yourself! The flag is flying again! After being damaged in heavy wind the weekend of November 1, a new flag is flying at American Fence & Flag! Our crews rebuilt the structure on which the flag hangs and raised the new Annin Tough Tex flag on Monday November 10 just in time for Veterans' Day. Feel free to stop by, take a picture or a selfie in front of the flag. See what it looks like on our facebook page (facebook.com/American Fence). You can also see a video of 10 of our employees taking the ALS Ice Bucket Challenge back in August. While you're there, please like our facebook page! Hurricane Sandy wrecked havoc along the Jersey Shore, with heavy damage inflicted upon boardwalks, beaches, supporting structures, and numerous buildings. Ocean Grove was no exception, as a sizeable percentage of the boardwalk was destroyed, along with railings, lights, and other components of the beachfront area. In the aftermath of Sandy, numerous volunteer organizations and individuals descended into Ocean Grove, often for extended periods of time, to assist with the recovery and reconstruction efforts. 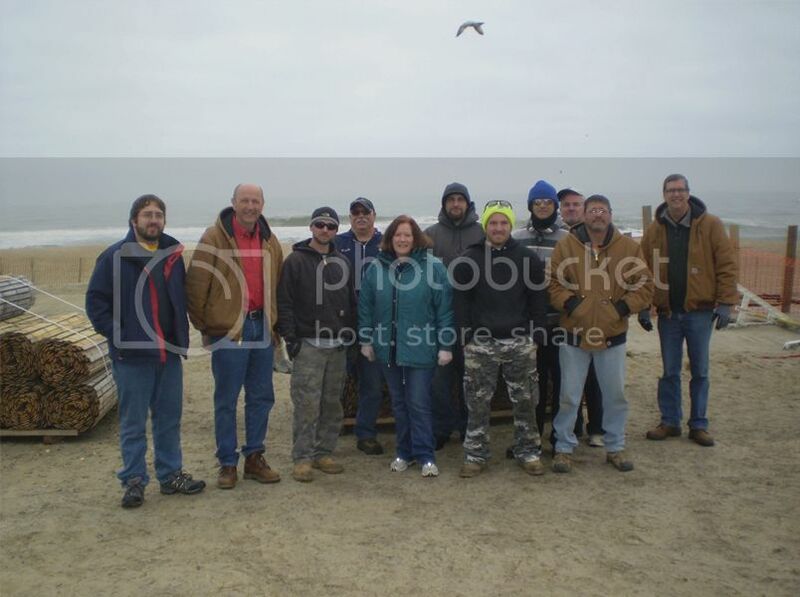 One of the examples of volunteerism in action is the American Fence and Flag Company of Whitehall, Pennsylvania, whose owner and staff has been onsite at the Ocean Grove beachfront several times this year to assist with the recovery and repair effort. Hal Mante is the owner of this family-owned company, which has been in business for 30 years. His involvement with Ocean Grove at this time is a natural progression of events. Mante said he has been coming to Ocean Grove for nearly 60 years. "I came here as a young child, probably when I was 1-2 years old. I came here every summer, and I continued to come here with my family. Basically, I've vacationed in Ocean Grove most of my life," he said. When Mante heard about the devastation Sandy inflicted upon Ocean Grove, his heart was touched, and he wanted to reach out and help this community. Mante said his first involvement with volunteer disaster recovery work was in the summer of 1973, after Hurricane Agnes inflicted damage to the Forty Fort, Pennsylvania area, where he resided at that time. The Susquehanna River flooded, and Mante served as a volunteer with the Red Cross. Following Hurricane Katrina, Mante took his entire company for a one-week work effort with Habitat for Humanity. He and his staff worked in this area for two consecutive years. "Our twelve employees volunteered their time," he said. Hurricane Sandy inflicted mostly wind damage in the Allentown/Bethlehem area - nothing close to the destruction that hit the Jersey Shore, he said. "Once we got ourselves cleaned up we thought, "How can we help?" When they heard about Ocean Grove being denied FEMA financial assistance, they wanted to help this community. Mante said he asked his workers if they would volunteer, they said "Yes." Mante telephoned the Ocean Grove Camp Meeting Association and said he wanted to serve. He was given the e-mail address for Bill Bailey, Director of Operations for the OGCMA. His initial e-mail was met with a quick reply from Bill, after which they had a "great conversation." He said to Bailey, "We're a fence company, and we'll do anything you need." Bailey replied, "We have a fence project. We need to secure the boardwalk with some type of snow fence." Mante said they could install all of the fences, to which Bailey said, "There's a shortage of fences." Mante made some calls, after which Ocean Grove obtained the fences at cost, and the material was shipped directly to the OGCMA. The American Fence and Flag personnel came to Ocean Grove for the first time this year at the end of March/early April. The OGCMA housed them at Grove Hall for four nights. During their stay, they put up fences along the boardwalk, did some railing work on top of the Youth Temple, and other boardwalk repair work. They replaced the railings where they were damaged, and they continue to work on the rail project. "The people were so nice - they came up to us and thanked us," Mante said. "A husband and wife brought us cookies. People showed us their pictures of the storm damage. Dozens of people thanked us for our volunteer efforts." Mante brought a busload to Ocean Grove from his church, Calvary Baptist of Easton Pa. His church paid for the bus, and 48 people came on board, plus an enormous amount of tools and supplies. The group helped rebuild about thirty feet of the fishing pier, with assistance from volunteer carpenters. The group from Calvary Baptist Church built some ramps, painted railings, and also added handicapped railings. Additionally, they removed the sand around the flagpole and gardens at the Main Avenue beachfront entrance. Mante spoke of a church group from Beulah, North Dakota, who traveled to and a half days by train to come to Ocean Grove. The group first worked in Long Island for two days before coming to Ocean Grove. "The OGCMA has been very accommodating during this process," Mante said. "The North Dakota students are very good workers, as they have worked on farms and lumbering and have good experience for these jobs." He noted that this group worked last Thursday, July 25, in the rain. Their work assignments included railings, scraping, and painting the old boardwalk Victorian light poles. On Friday, the group installed railing along thirty feet of the fishing pier. Mante said, "The Ocean Grove boardwalk will be rebuilt, and we will continue to rebuild the railings." The American Fence and Flag's website can be accessed via www.american-fence.com. On this website, a video, "What Happens to a Town When Disaster Strikes" depicts the company's post-Sandy recovery and repair efforts in Ocean Grove.